Last update issued on August 28, 2003 at 03:50 UTC. The geomagnetic field was quiet to active on August 27. Solar wind speed ranged between 418 and 532 km/sec. Solar flux measured at 20h UTC on 2.8 GHz was 125.7. The planetary A index was 13 (STAR Ap - based on the mean of three hour interval ap indices: 14.1). Three hour interval K indices: 22343333 (planetary), 22343433 (Boulder). At midnight there were 9 spotted regions on the visible disk. Solar flare activity was low. A total of 5 C class events was recorded during the day. Region 10440 near the southwest limb produced a C1.6 flare at 02:50 UTC. Region 10436 decayed further and could become spotless today. Flare: C1.9 at 05:08 UTC. Region 10441 decayed slowly and quietly. Region 10442 decayed in the leading spot section. Region 10444 developed slowly and quietly. Region 10445 decayed slowly. 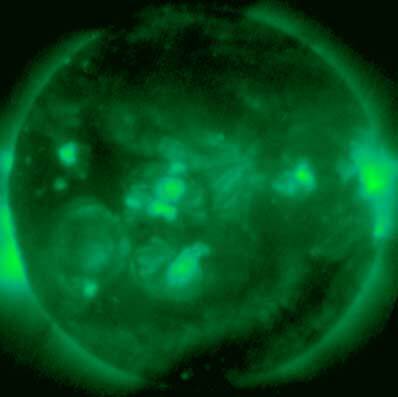 Flare: C1.3 at 09:05 UTC. New region 10446 emerged in the southeast quadrant on August 26 and was numbered the next day by SEC. [S239] A new region emerged in the northeast quadrant on August 26. The region developed slowly on August 27. Location at midnight: N19E44. [S240] This region emerged on August 27 to the north of region 10444. Location at midnight: N16E06. [S241] A new region is rotating into view at the southeast limb and could produce at least C class flares. Location at midnight: S16E80. Flares: C1.2 at 16:32 and C1.1 at 22:45 UTC. 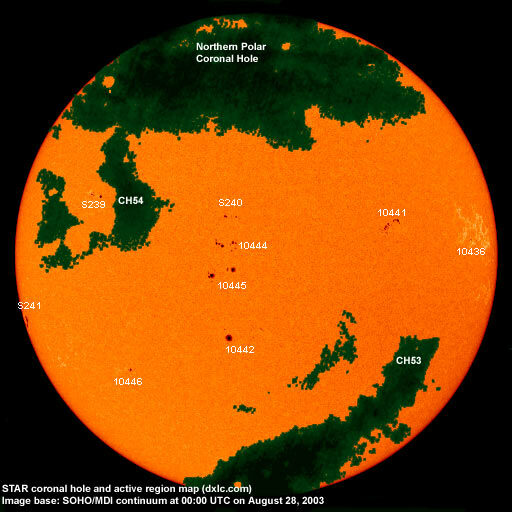 August 25-27: No potentially geoeffective CMEs observed. A filament eruption near region 10442 between 15 and 18h UTC on August 27 may have been associated with a CME. A coronal hole (CH53) in the southern hemisphere may have been in a geoeffective position on August 25. A coronal hole (CH54) in the northern hemisphere could reach a geoeffective position on August 30. Processed GOES SXI coronal structure image at 00:00 UTC on August 28. Base SXI image courtesy of NOAA/SEC. The darkest areas on the solar disk are likely coronal holes. The geomagnetic field is expected to be quiet to unsettled until September 1. 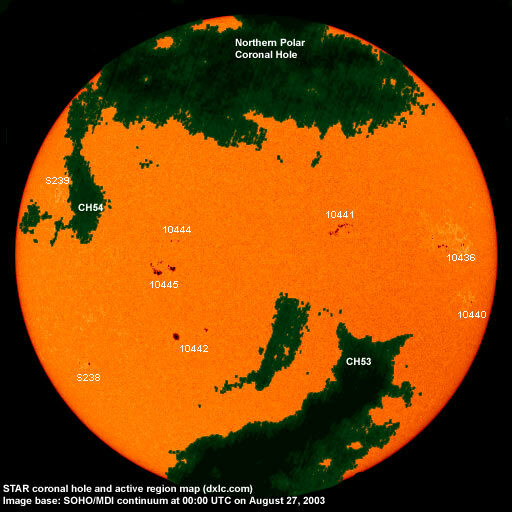 There is a chance of some geomagnetic effects from the northernmost extension of coronal hole CH53 on August 28-29.